Ziplining activity is a thrilling outdoor adventure in Branson that will let you feel the adrenaline rush of a breathtaking and heart-pumping zipline ride experience. This zipline outdoor adventure will surely give you a complete and fulfilling vacation in Branson. Branson Zipline and Canopy Tours and Indian Point Zipline Adventure Tours are some of the best zipline providers in Branson. Both of these zipline companies offer fantastic outdoor activity above the forested area where you can have the chance to enjoy picturesque views of the wildlife. Branson Zipline and Canopy Tours is located at Wolfe Creek Preserve on the east side of Highway 65. A huge amount of money was invested by the Zipline and Canopy Tours in Wolfe Creek Preserve so that zipline rider enthusiasts can enjoy a safe and a secure ride adventure of a life-time. This great ride adventure with the Zipline and Canopy Tours comprise of traversing through canopies, multiple sky bridges and exciting zipline travel from platform to platform. Once your zipline tour begins, you get to see beautiful views of the wildlife and spectacular sceneries around the hillsides of the Ozark mountains. While you are enjoying a thrilling ride experience above the Wolfe Creek Preserve, you can see the majestic Henning Hawk Watch Tower at the Ruth and Paul Henning Conservation Area. You will also get to see the scenic view of the Silver Dollar City where the Skycoaster at the Go Kart track can easily be spotted while you are having a fun ride with the zipline. 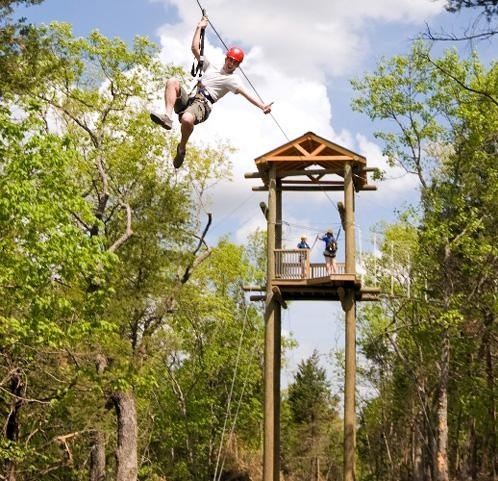 The Ozarks Xplorer Canopy Tour is the best seller in the preserve which is an ideal zipline tour for small family. A walking nature tour is also offered for those who are not comfortable with heights. The Indian Point Zipline Adventure Tours is another zipline ride provider in Branson that offer six ziplines that both utilize a sitting harness system where you can enjoy a safe and secured journey as the zipline zooms through the forest. This zipline ride adventure with the Indian Point will let you zip through the beautiful trees along the magnificent Table Rock Lake. Beautifully located just a half mile from Silver Dollar City and situated near the Deer Run Grocery, the zipline adventure will surely delight your day once you are cleared from the harness. Your zipline adventure with the Indian Point Zipline allows you to see bird’s eye view of the hills of Indian Point Peninsula. The Indian Point Family Fun Park near the zipline site offers multiple recreational activities that include canoe and kayak rentals, water park hydro slides and delightful dining experience. Inexperienced zipline riders who are hesitant to take the adventure tour will surely change their minds after guides provide plenty of instruction and lessons in accommodating new riders as well as experienced zipline riders. If you want to enjoy more fun with the thrilling zipline ride, there are other zipline locations in Branson that you can try such as the Vigilante Extreme Ziprider, Zipline USA, and Branson Adventures Zipline.